The Heart of Texas Writing Project is The University of Texas at Austin’s affiliate of the National Writing Project. Our Summer Institute will help you develop your knowledge and ability as a writing teacher and as a leader in literacy professional development. 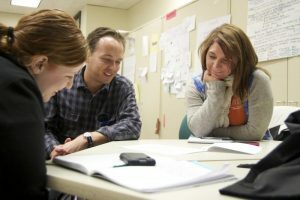 Participants at this institute write, read, research, and consult with other teachers. Once you have participated, you will enter an exciting community of excellent teachers from the Austin area. As part of this group, you will receive support in your teaching and continuing professional development. You may also have opportunities to provide professional development services to other teachers. We invite experienced teachers of writing to apply. Please read all of this information carefully. Required dates and deadlines are important to our work. Applications are due before February 26, 2019: Online application form submitted AND supporting documents emailed to heartoftexaswp@gmail.com. Monday, March 4: Required interviews. At UT’s Sanchez Building, with group appointments beginning at 4:30. April 6: First required Saturday orientation meeting, 9:30 am – 2:00 pm. May 4: Second required Saturday orientation meeting, 9:00 am – 2:00 pm. 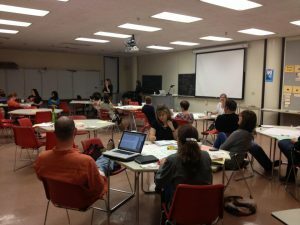 June 10 – July 5: Summer Institute at UT’s Sanchez Building. First three weeks: M-Th, 9:00 am – 3:00 pm. Please note: The Summer Institute is an experience that cannot be engaged with at a distance. Your presence and daily engagement is essential in order for you (and others) to benefit fully from the Summer Institute. Attendance is required. If you already know of conflicts in your schedule, please let us know about them in your application materials. If you already know you cannot make two or more days of the institute, another year might be better timing for your participation. Please also note that space is limited for our Summer Institute.